Since the criteria for "presidential greatness" are indeterminate, historians' and political scientists' evaluations inevitably differ. 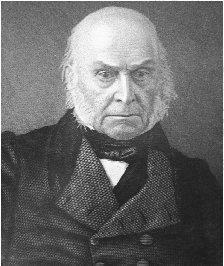 Yet, interestingly, even one of John Quincy Adams' most knowledgeable as well as warmest scholarly admirers, Samuel Flagg Bemis, concedes the failure of his presidency, devoting no more than twenty-two words to it in his thirty-five-hundred-word essay on Adams in a recent edition of the Encyclopaedia Britannica . In the conventional historians' wisdom, John Quincy Adams' presidency is worth remembering less for anything Adams may have done in administering the office than for the unprecedented manner by which he came to occupy it and the fascinating, if dismaying, political campaign by which, after one dismal term, he came to lose it. Charles Francis Adams, ed., Memoirs of John Quincy Adams, Comprising Portions of His Diary from 1795 to 1848 , 12 vols. (Philadelphia, 1874–1877), is an indispensable record of Adams's reactions to events. Allan Nevins, ed., The Diary of John Quincy Adams, 1794–1845: American Diplomacy, and Political, Social, and Intellectual Life, from Washington to Polk (New York, 1969), is a selection from the diary by an informed historian. Walter La Feber, ed., John Quincy Adams and American Continental Empire: Letters, Papers, and Speeches (Chicago, 1965), contains other important documents. Marie B. Hecht, John Quincy Adams: A Personal History of an Independent Man (New York, 1972), is competent, fact-filled, and sensible. Mary W. M. Hargreaves, The Presidency of John Quincy Adams (Lawrence, Kans., 1985), is a useful single-volume summary of his term. Lynn H. Parsons, John Quincy Adams: A Bibliography (Westport, Conn., 1993), is a thorough book-length list of sources for further research. Robert V. Remini, The Election of Andrew Jackson (Philadelphia, 1963), and Andrew Jackson and the Course of American Freedom, 1822–1832 (New York, 1981), provide respectively an invaluable study of how the new Jacksonian party organized to defeat Adams and an informed and controversial interpretation of the politics of the period. Edward Pessen, Jacksonian America: Society, Personality, and Politics , rev. ed. (Homewood, Ill., 1978), gives the social, cultural, and economic as well as political background of the antebellum decades. Glyndon G. Van Deusen, The Jacksonian Era, 1828–1848 (New York, 1959), is a balanced account of national politics during that period. This imformation about John Quincy Adams is amazing because I have to do a report on him and this page tells me everything that I needed to know about him. So thank you for helping me out.